Marchionne said Fiat Chrysler won't consider selling Jeep as a separate entity. 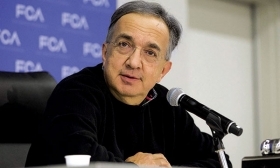 NEW YORK -- Sergio Marchionne confirmed speculation that Ferrari will make its first SUV while tamping down rumors that Fiat Chrysler Automobiles may part ways with Jeep. Marchionne has increased the value of Fiat Chrysler for top shareholder Exor and other investors by spinning off units and spending heavily on a global expansion of the Jeep SUV brand. Worldwide sales of the profitable vehicle type will probably increase by 9.4 million units from 2017 to 2024, accounting for two thirds of the auto industry’s expansion, IHS Markit estimates. Ferrari will present a new five-year plan that runs through 2022 in the first quarter of 2018, Bloomberg News reported in August. The Maranello, Italy-based company is considering adding a roomy four-seat “utility vehicle” as part of a major expansion push beyond its traditional supercar niche in a bid to double profit by 2022, people familiar with the matter said at the time.